This is one of the amusing releases from Carlton Ware in their 'Standing Ware' series. 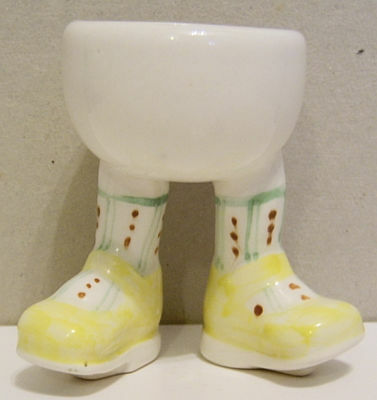 This one is an Eggcup with medium yellow sandal-style shoes, green striped socks with red spots. One foot is backstamped with the edition number '9' and Lustre Pottery's backstamp and a 'cup' drawing on the other, also indicating the date of 2005. This was made in the Studio with a maximum production of only 100 pieces. Designed by Roger Michell (Lustre Pottery) for Carlton Ware, this particular piece is a relatively 'hard-to-find' egg cup. The overall height of the Egg Cup is 2.75 inches (7 cms).